China Precision CNC Machining Part Manufacturer Junying Offers Custom CNC Machining Parts, Tolerance ±0.01mm, OEM/ODM Services Available. 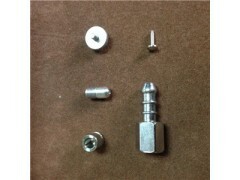 Small Parts Assembly and Sub-Assembly. Shapes in Squares, Rounds or According to Custom Orders. Internal & External Grinding, Tolerance ±0.01mm. Multi-axis Machining & Rotary Transfer Units with CNC Attachments. Precision Machining With Out Diameter from 2mm to 90mm and Inner Diameter as Small as 0.30mm, Tolerance ±0.01mm. Irridite / Chemical Film / Conversion Coating. Plating with Nickel, Electroless Nickel, Zinc, Chromate, Dichromate, Tin, etc.